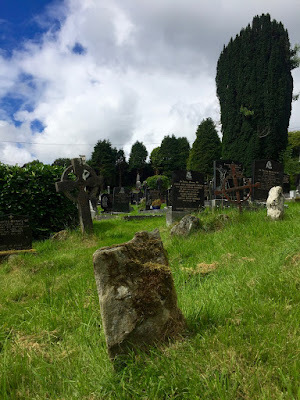 After Santa Cruz: Everything I May Write About St. Gobnait and Hints at What I Can't. 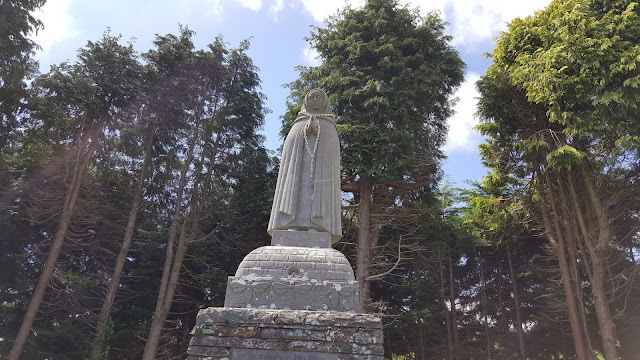 Everything I May Write About St. Gobnait and Hints at What I Can't. 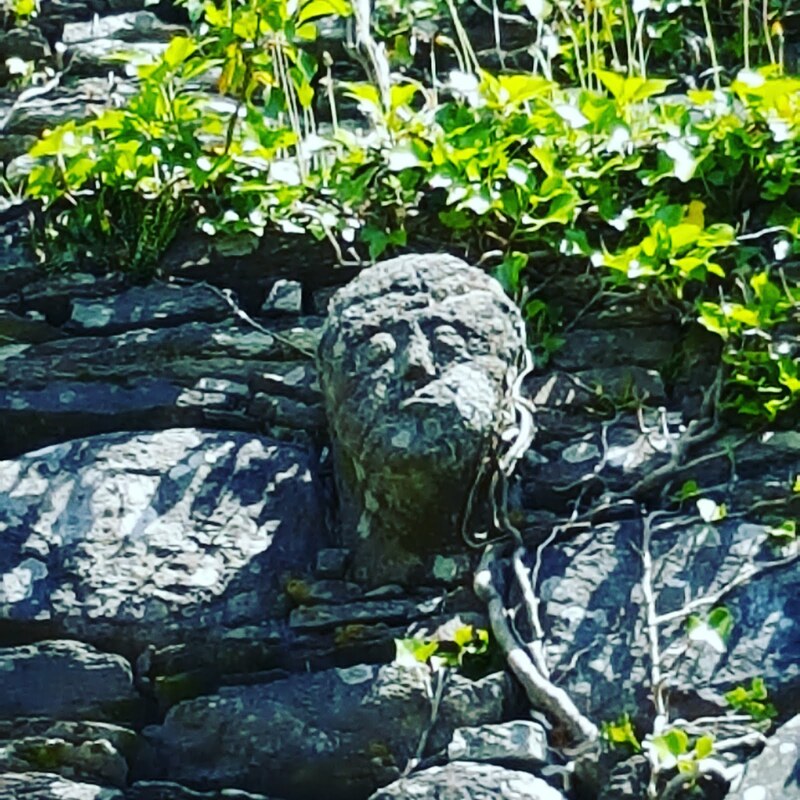 All summer, St. Gobnait has been our constant companion. She's one of the popular saints in this part of Ireland, water from her well cures cancer, and she's the matron of beekeepers and metal workers (with whom I include techies like me). 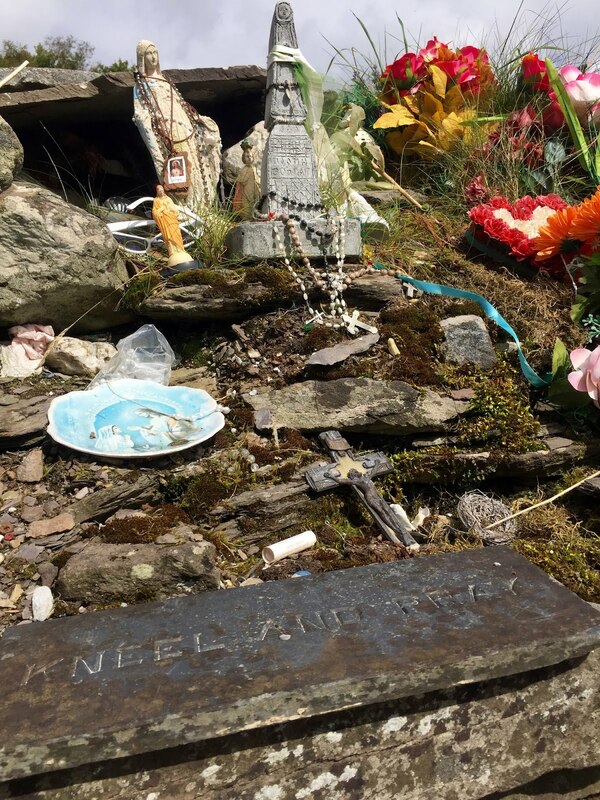 Her shrine in Ballyvourney is on the way to Cork so we stop there as often as we can. 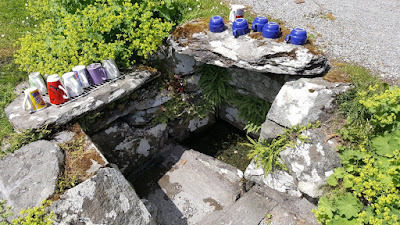 To recap the story so far: in "A Few Things I Like About Ireland," I wrote of visiting St. Gobnait's shrine for the first time. Since then, we have visited St. Gobnait's Wood, and kissed the Ballyvourney Stone. To help you picture this lovely hillside, Voices from the Dawn has provided us with 360 photos of the shrine, as well as research into sheela-na-gig of Ireland. 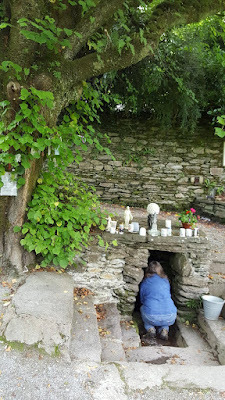 (If you want to read a interesting travel blogs about her shrine, try this one by an Australian woman and this one from a blog about pilgrimages. 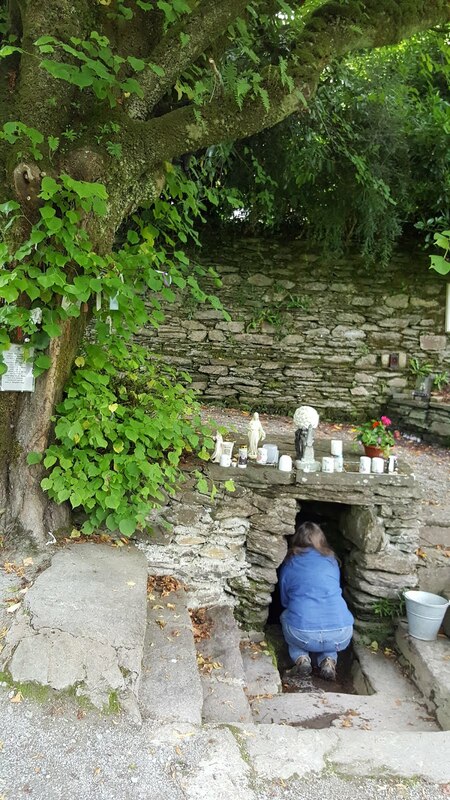 St. Gobnait's shrine offers us two wells. One is near her "house," next to her statue. The other is hidden down the road. Last month Artemis hadn't seen the lower well yet, so we stopped to visit it. 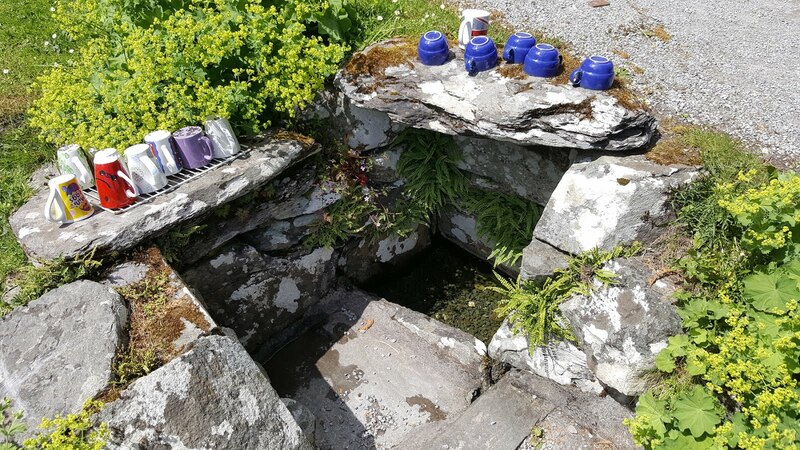 When we arrived, a young family were there with their prayers and cups, so we slipped through a sheepgate and explored the abandoned farm that lies between the burial ground and the well. 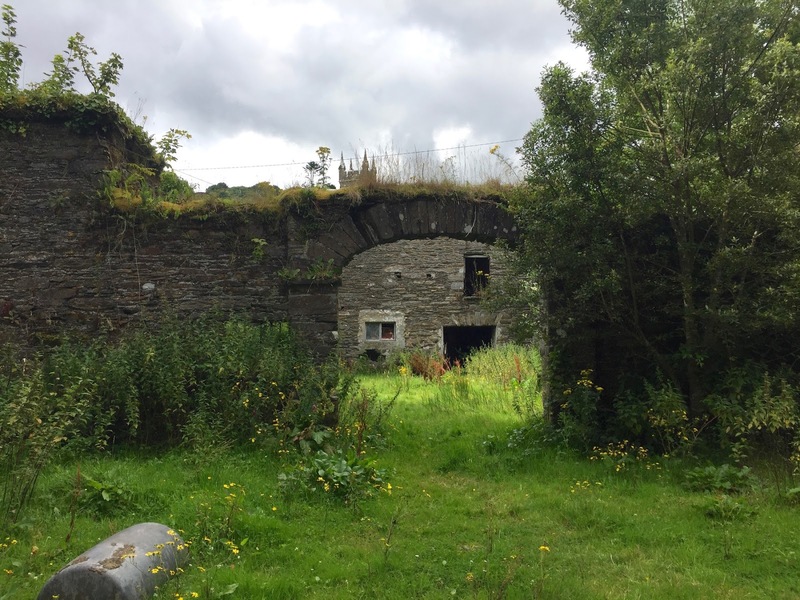 This ruin is sad and magnificent, with wide stone arches, slate shingles, and an entry with leaded glass windows. An old tractor rusts next to a grand doorway, and in the yard great industrial rakes and dangerous flails decay under nettles and berries. The name of this townland is "glebe," which is the name of farmland given for the support of clergy of Church of Ireland, so perhaps that is why this house is overbuilt, and has space for carriages to be stored just beyond that arch. 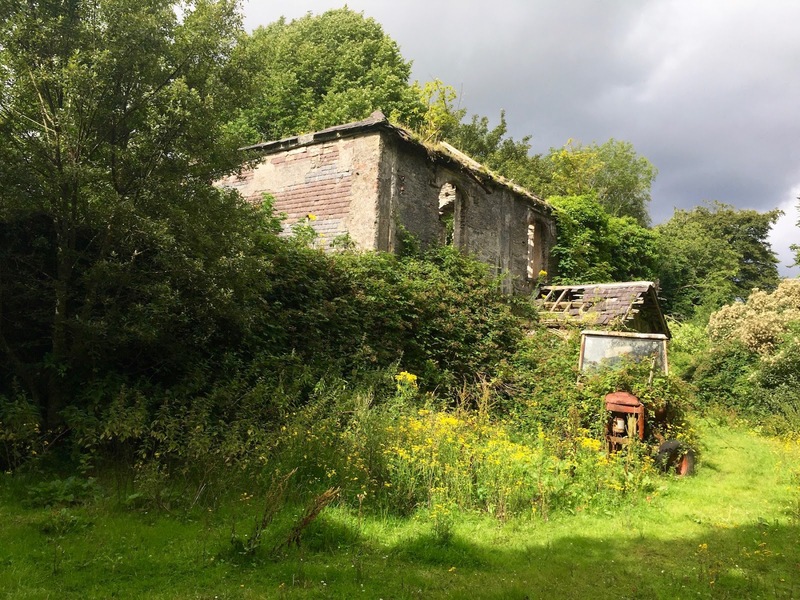 There are other "glebe houses" in Ireland, and they are all a bit more posh than the remote location would indicate. We soon returned to the well, where we sat quietly, absorbed the peacefulness, and took a sip of water. Just as we were about to leave, up walked four women of about our age, with that look about them that said they were not Catholics. We later learned that the women were on a tour lead by Teresa Collins. They invited us to join them. Teresa suggested that as it was Lughnasa, now was the time to ask Gobnait to show us something. "You kneel here," she instructed in that way that Irish people often do, sharing their knowledge of how to get things done. "And put your head inside, until you see what she has to show you." Each woman did so, and reported what she saw. "Of course the first thing you see is the Goddess, and that is yourself." We all agreed that we were goddesses. Then we sang a few lines of Starhawk's Well Chant. We followed Teresa and the other women up the hill to the statue that overlooks her shrine. We started at Gobnait's statue, carved by Seamus Murphy, Ireland's great stone carver. Teresa showed us how Gobnait's stories are symbolized there on her statue. Herself is depicted as a nun, with the deer, bee, book, and ball carved into the beehive she stands on. We walked over to Gobnait's house, where Teresa said Gobnait lived with 22 nuns. She led us in a ritual with honey, and we listened to the birds, the birds that have always been there on that hillside, for 1500 years as women tasted the sweetness of honey in this sacred place. Description: Circular hut site, c. 30m W of Ballyvourney graveyard (CO058-034003-), known locally as St. Gobnait's House; excavated by M.J. O'Kelly in 1951 (O'Kelly 1952, 18-40). Excavation showed two periods of occupation with little or no interval between. Firstly, rectangular wooden house (or houses) built 'by persons interested in iron smelting' (ibid., 36). Due to dampness this structure cleared away and area raised 6ins. On this was built circular structure with floor diameter of 20ft; wall 5ft wide with inner and outer stone facing and rubble core. Door faced S and retained by two large jambstones (CO058-034002-), mistakenly marked 'Galláin' on 1940 OS 6-inch map. Roof probably of thatch. Numerous pits in interior, associated with iron smelting debris. Among the finds recovered were items associated with metal working, like crucibles and tuyere fragments (Edwards 1990, 87); domestic items included a spindle whorl, 5 iron knives and fragments of whet stones and querns. The only decorative finds were an iron bead and a jet bracelet. No dating evidence recovered. Well (CO058-034011-) (diam. 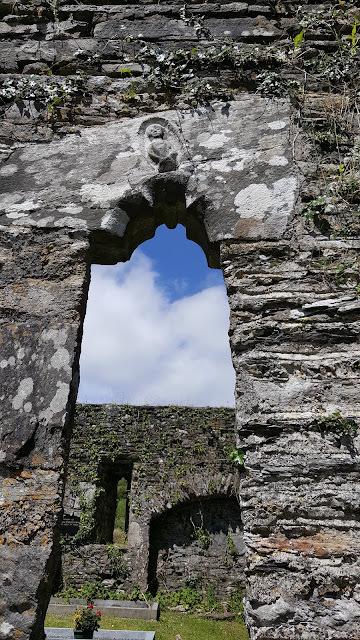 18ins; D 2ft 6ins), 6ft S of door of house, thought to be contemporary with it; now reconstructed with stone surround and two steps leading down to water; venerated as holy well (O'Kelly 1952, 20). Hut site is conserved and now first station in local pilgrimage of St. Gobnait. St. Gobnait is known to us through folklore. Folklore is not history, nor is it literature. Folklore is about the present storyteller, her time and her concerns, as much as it a tale from the past. No one bothers to tell an old story if it has no bearing on the present. Teresa told us many stories, some I already knew, and I loved how she told them in her own way, for her own purposes. After learning that recording failed, I made notes on what I remembered after we left that day, but even now I don't want to retell Teresa's stories, or detail every sacred thing we did there. Some mysteries are to be experienced, and those of us who are lucky to have encountered them can only extend an encouragement to say yes when invited along. We left Gobnait's house, passed through the deer gate, and Teresa led us to the place called St. Gobnait's grave. 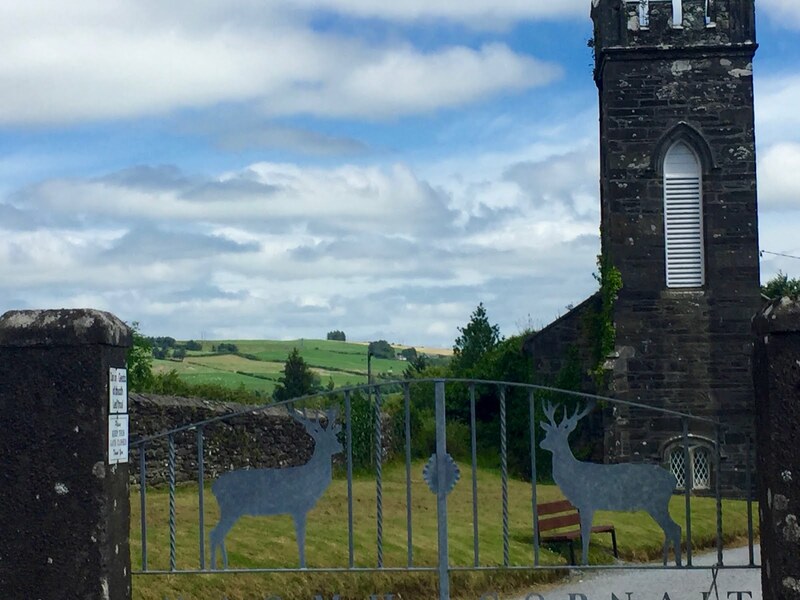 The white deer gate, a Church of Ireland, the Cork countryside. Teresa explained that Pagans tend to leave flowers, and Christians tend to leave rosaries. Students leave a pen when they pray for help with exams, and smokers leave lighters when they pray for her help in quitting. "It says 'kneel and pray,' "said Teresa, so we took turns kneeling and praying. There are two bullan stones on the grave. Archeologists say bullan stones are associated with metalworking, where stones were ground up before smelting. 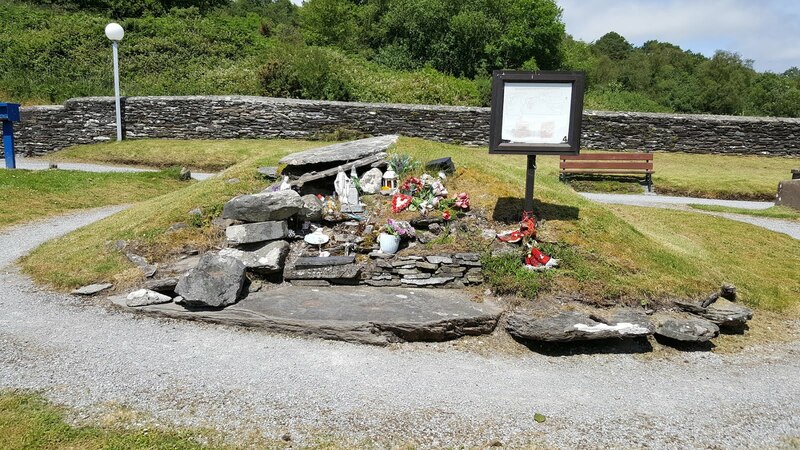 Description: Situated between ruin of Ballyvourney church (CO058-034007-) and hut site (CO058-034001-) and, with them, marking stations in the pilgrimage of St. Gobnait (Harbison 1991, 133-6). 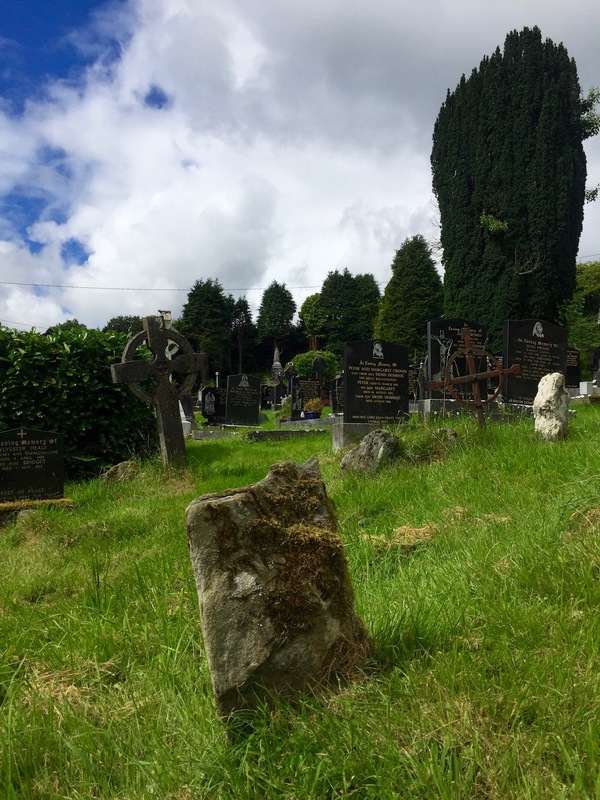 Known locally as St. Gobnait's Grave (O'Kelly 1952, 38). Monument consists of a sod-covered mound of loosely-packed stones (4m N-S; 5.6m E-W; H 1.3m). At the top is a flat slab of sandstone marked with roughly incised pilgrim crosses. On S side, below this, is flat slab set as a "kneeler", on the upper surface of which is cup-mark depression (diam. 0.2m). Close by are two bullaun fragments (CO058-034005-). Teresa says that the bullan stones are bowls for women's offerings. "Women give back to the goddess what they are given," she says. "They are given fertility and give back to the goddess in the form of menstrual blood." Seems like both stories could be true. None of us was about to give back any blood, but I got the feeling Teresa was giving us an instruction, should we feel the gratitude. Teresa gestured to the burial ground, saying, "Murphy, Lynch, O'Herlihy, and Twomy are the most common surnames in this area, and Abby the most common first name. Abby means Gobnait, for Gobnait is the Irish name for Abigail." 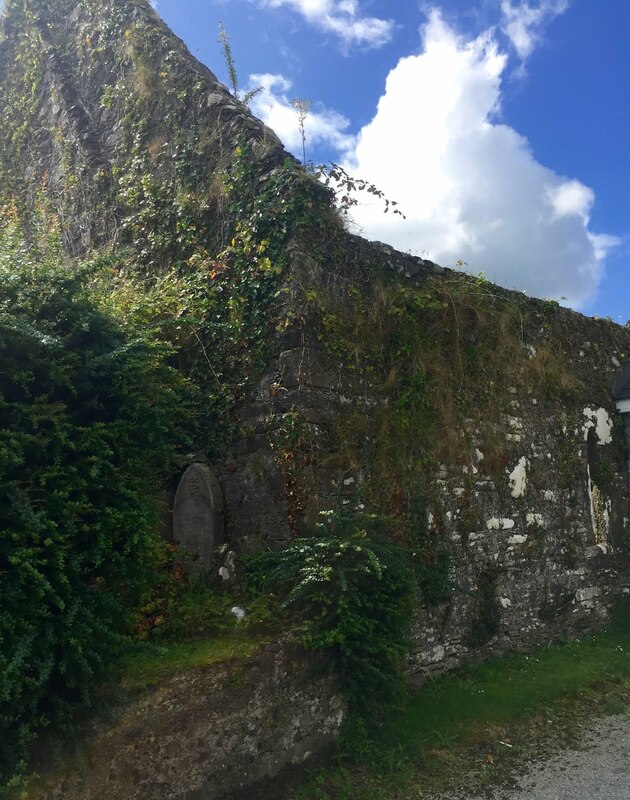 Teresa showed us St. Gobnait's healing ball, secreted in the wall of the medieval chapel. She showed us how to stand in the window, touch the sheela-na-gig, then jump through the window to ask her to bring our desires to fruition. She showed us the crone's head above the altar, and encouraged us to sense her as we stood beneath it. She revealed the corner where a bit of altar from St. Gobnait's own church is preserved. She showed us the neolithic tomb next to the church. She told us many stories, and I'm lucky to have heard them. that was preserved and placed here when building the medieval church. fragment of the altar from St. Gobnait's church. Description: Near E end of graveyard (CO058-034003-); ruins of Ballyvourney parish church, known as Teampall Ghobnatan (O hEaluighthe 1952, 55) which, according to tradition, stands on site of St Gobnet's convent (O'Kelly 1952, 18). Church consists of nave (19.2m E-W; 9.25m N-S) with chancel (8.55m E-W; 6.55m N-S) added at E end; walls stand to full height, except upper part of E gable of chancel which has fallen. Nave entered by doorway, W of centre in S wall; only one stone of door jamb survives. Nave lit by simple slit window near W end of S wall and by pair of opposite windows, with cusped round-headed lights, near E end of N and S walls. On external face of lintel over latter window in S wall is a human figure, carved in false relief, which may possibly be a sheela-na-gig (CO058-034008-). In centre of W gable, c. 2m above present ground level, is lintelled doorway, facing inwards, as is slit window overhead; these imply former presence of structure against outside of W gable but only low wall, enclosing rectangular area, stands here now. This could be remains of 'steeple' which Smith (1750, vol. 1, 185) refers to as 'ready to fall with age'; by mid 19th century, this 'was a mere heap of stones' (O hEaluighthe ibid.). At E end of N wall of nave is shallow recess covered by segmental arch; opposite in S wall is small wall press. 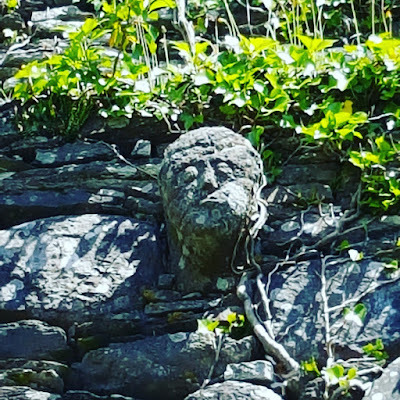 On W face of E gable of nave very worn carved human head projects; this was probably once voussoir in 12th-century Romanesque arch of earlier church; head known locally as 'an gadaidhe dubh' (Henry 1952, 41-2; O'Kelly 1952,37-8). Slightly off-centre, bluntly-pointed chancel arch; O'Kelly (1952, 37) noted jambs of chancel arch 'built of carefully squared blocks of brown sandstone set with such close joints that they bear the stamp of 12th century work'. Chancel lit by single-light windows in S and E walls, both showing signs of repair; present lintel over window light in E wall is reused head of twin ogee-headed light. Quoin at NE angle of nave inscribed with pattern 'which seems to be a Greek cross, but inscribed in a square frame' (Henry ibid. ); this stone is unlikely to be in its original position and was probably part of fabric of Romanesque church (O'Kelly 1952, 29). Interior now filled with 18th-, 19th- and 20th-century burials. Church is part of pilgrimage route, with five stations located about ruin; in connection with this a number of electric lights have been affixed to walls of church. In 1993 PVC-windowed lean-to built against external face of N wall of nave, to accommodate donated set of stations of the cross. We made a plan to see Teresa again in October when we will be joined by visitors from California, and we'll hear more stories. 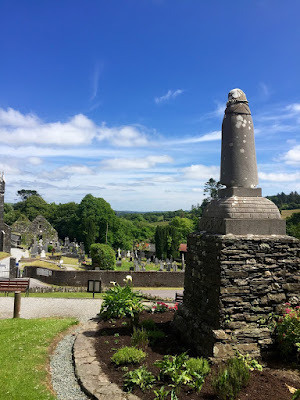 We visited St. Gobnait's shrine again the day after my birthday at the end of August. Different stuff happened that I'll hope to write down. That story ends in blood and fairies.